National Fertilizers Limited, a Govt. of India Enterprise, has taken measures to provide information to the citizens of the country in accordance with The Right to Information Act, 2005 (Act). This section of NFL’s official website along with other relevant sections contain information as required to be published under Section 4 (1)(b) of the Act. III: Procedure followed in the decision making process. NFL is a company managed by its Board of Directors, constituted under the Company's Act,consisting & of Govt. of India Nominees, independent Directors and Functional Directors. 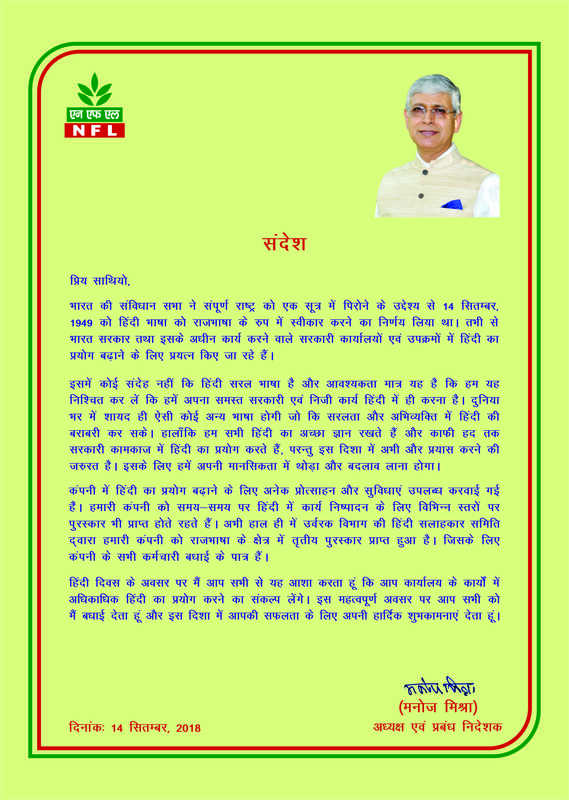 The day-to-day activities of NFL are managed under the leadership of the Board of Directors assisted by Functional Head of the respective Department. V: Rules, Regulations, Instructions, Manuals and Records held by company or under its control or used by its employees for discharging its functions. NFL Employees (Conduct, Discipline and Appeal) Rules /Certified Standing Orders. VI: Statement of the categories of documents that are held by it or under its control. NFL holds commercial and technical documents relating to the business operations of the company and data relating to its employees. VII: Particulars of any arrangement that exists for consultation with, or reorientation by, the members of public in relation to formulation of its policy or implementation thereof. NFL being a commercial entity, its policies relate to internal management and, hence, there is no arrangement for consultation with members of the public. All of its Policies are formulated in compliance with applicable provisions of statutes, regulations etc. NFL, however, collects customer's feed back by various modes of communications and carries on its business by satisfying various customers? needs in the business interest of NFL. VIII: Statement of boards, councils, committees and other bodies consisting of two or more persons constituted as its part or for the purpose of its advice, and as to whether meetings of those boards, councils, committees and other bodies are open to the public, or the minutes of such meetings are accessible for public. Board of Directors is constituted following the provisions of the Companies Act, 1956 consisting of Government of India nominees, independent Directors and Functional Directors. IX: Directory of Employees of NFL. X: Monthly remuneration received by each of company's Officers and employees, including the system of compensation as provided in its Regulations. XI: Budget allocated to each of company's agency, indicating the particulars of all plans,proposed expenditure and reports on disbursements made. NFL prepares capital budget every year for its ongoing projects as well as new projects and other schemes. NFL also prepares revenue budget every year. Expenditure incurred by NFL is governed by these budgets. XII: Manner of execution of subsidy programmes, including the amounts allocated and details of beneficiaries of such programmes. XIII.Particulars of recipients of concessions, permits or authorization granted by the company. XIV: Details in respect of information, available to or held by the company, reduced in an electronic form. Information is available at www.nationalfertilizers.com. XV: Particulars of facilities available to citizens for obtaining information, including the working hours of a library or reading room if maintained for public use. Company does not maintain any public library. Refer to Sr. No. XVI & XVII for the procedure of obtaining information. XVI: Name(s), designation(s) and other particulars of Public Information Officer(s) and Appellate Authority. Public Information Officer/Assistant Public Information Officer. In case it is decided to provide the information, the Requester shall be informed of the additional fees required to be deposited by him/her for the information sought and information shall be furnished after the deposit of the fee by the Requester as per the Act. In case the Requester who does not receive a decision within the time specified in sub-section (1) or clause (a) of sub-section (3) of section 7 of the Act, or is aggrieved by a decision of the PIO, as the case may be, may within thirty days from the expiry of such period from the receipt of such a decision, prefer an appeal to the Appellate Authority for redressal of the grievance.